Earn $4.09 in Rewards credit (409 points) What's This? 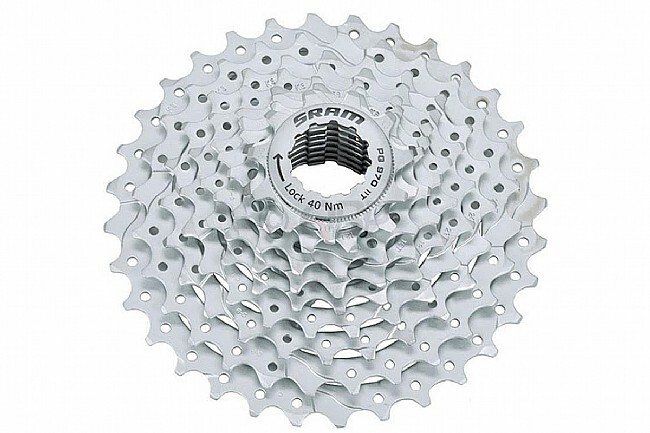 An excellent quality 9-speed cassette offering smooth reliable shifting at a low weight. Shimano/SRAM 9-speed compatible. 14 of 15 customers found this review helpful. I have used this every year once cyclecross is over. Change it out with a new chain and your drive train will shift with ease and run so silky smooth. Plus you wont feel bad when you want to get down and dirty cause it's so affordable! This is a reliable cassette. I use it on a mountain bike that i use to commute through midwestern winters and rain in the summer time. At this price, I just replace both cassette and chain every spring. I got the 11-28 version of this and I've had this for about half a year by now and still in tip top shape. the 28 tooth helps get my up to 15% gradient (paired with a 5034 chain ring), but any steeper, I have a little bit of a harder time. Despite that, it works as expected, shifts smooth, and is actually relatively cheap compared to the competitors. As long as you keep it clean, they should last a very long time. I bought the 11-28's and although at times I do run out of gears to go through while climbing, they are just great. very reliable and durable. Only had one issue with them I had the proper amount of spacers, but for some reason, the 11 tooth gear wouldn't fit too steadly, took it to a local bike shop and said they don't know what is wrong. I let it be because I usually never even get to the 9th gear in the rear, but if you do, be cautious. Bought as replacement on my commutertouring bike (Surly Disk Trucker) works great!! Easy to switch out. I use these for everything from commuting to long day rides to brevets. Good longevity and shifting. sturdy, light, does the job! I put this on my commuter, I have a 10% grade in to work and it gets me up the hill. I use it on my training bike. Works great. I've had in on my bike for a month and so far it's working great. It is a lot quieter the my last cassette . Overall I'm very happy with it. Why Pay more? I put this on my ventage bike, shifts flawlessly? Nice upgrade from my Ultegra 9spd! I first switched to the SRAM PG-970 because it was the cheapest Shimano-compatible 9spd cassette I could find. Surprised when it arrived - it made the old Ultegra cassette look like something from Soviet-era Russian agricultural implements in comparison! The SRAM is lighter, looks better, shifts better, and seems like it will wear forever. Just replaced the 11-23 with a 12-26 because I will be doing more long, steep hills and wanted lower gears, but with over 10,000 miles on the old one, it shows little sign of wear. I actually wanted an 11-26 but couldn't find one, so disassembled the 12-26 and removed the 14, move the 13 and 12 up one position, and fitted the 11 from the old cassette and voila! Just what I wanted. It is not as smooth as higher end cassettes, some noise & jumping. 6 of 11 customers found this review helpful. Climbing a steep grade in 42x23 my rear 23 tooth gear cracked in half. Thought my chain had broken. After I picked myself up off the road I found the gear in several pieces on the road. Brought cassette and broken gear to mechanic at REI who said he'd never seen or heard of that happening. I have sram cassettes on my road wheelset and cyclocross wheelset. Both work great and were a great value. Cant see why someone would pay more for a cassette. 2 of 13 customers found this review helpful. I wore this cassette out with over a 1000 miles before having to replace it. Took my Bike out for a ride and was not able to climb a single hill before the chain started jumping real bad. Had just replaced the chain and I should had replced the casette. But live and learn.